Who are the women behind PDPlan4life? Sheryl Jedlinski is a professional writer living in the Chicago suburbs with her husband Tony. When diagnosed with PD in 1998 at the age of 44, she decided to target her writing skills to advance issues important to the Parkinson’s community. Her letters to the editor appear in newspapers across the country. Most recently, Sheryl and her neurologist, Dr. Cynthia Comella of RUSH Medical Center in Chicago, broke new ground on the conference circuit, delivering humorous, yet information-packed presentations on topics such as, “Developing long term doctor patient relationships that outlast many marriages,” and “The art of doctor/patient communication.” Email Sheryl at pdplan4life@konoso.org to book this dynamic duo for your next conference. As Vice President of Communications for the Board of the Midwest Chapter of the American Parkinson’s Disease Association (APDA), Sheryl writes and designs a quarterly newsletter, maintains and updates the chapter web site, and assists in the development of promotional materials for various Chapter events. As a member of the Parkinson Pipeline Project, she co-authored “Ethical Issues in Clinical Neuroscience Research: A Patient Perspective,” which appeared in the July 2007 issue of Neurotherapeutics: The Journal of the American Society for Experimental NeuroTherapeutics. Sheryl has participated in several exercise-related clinical trials and in the original CoQ10 trial. 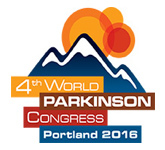 2011 Alan Bonander Humanitarian Award for exemplary contribution to the Parkinson's community. 2007 Murray Charters Award for outstanding service to the PD community. 2006 AZ-APDA distinguished volunteer of the year. Jean speaks to students in college physical therapy programs about life with Parkinson's, providing personal insights to better prepare them to help this special group of patients. Jean is participant #3 in the Phase 1 Open-Label Dose Escalation Safety Study of Convection Enhanced Delivery (CED) of Adeno-Associated Virus Encoding Glial Cell Line-Derived Neurotrophic Factor (AAV2-GDNF) in Subjects With Advanced Parkinson's Disease. 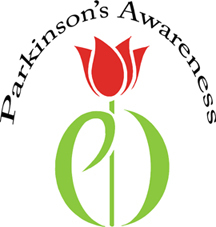 Jean led the successful grassroots movement for a national symbol for Parkinson's disease: the stylized tulip at right, designed by Karen Painter, of Washington state. This symbol represents all people with PD - without regard to organizational affiliation. Read their story. Jean uses art to spread PD awareness. Her work can be seen in neurology offices throughout the U.S.